When we began our journey across Australia’s Red Center, our tour guide-slash-driver handed us a marker and told us to write our names on the window of the van. It’s a way for everyone in the group to easily remember each other’s name. Since then, every time I looked out the window, I saw my name etched in every dawn and dusk, every starry sky, every vivid picture that sped past me. Through the glass, every place is a canvass. Every moment a masterpiece. The Outback is a wild, insane artist. Our destination: Uluru, Australia’s most iconic landmark. 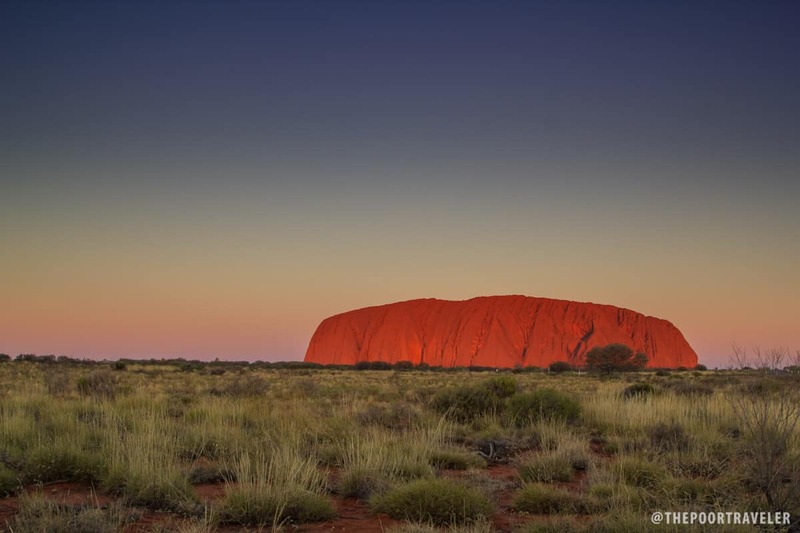 Regarded by many as the heart of the Outback, Uluru is located almost at the center of the continent. 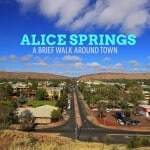 The nearest major town is Alice Springs, where our trip began. To the Aborigines, Alice Springs is known as Mparntwe. Since way before Europeans arrived, it has been an important place to the Aranda (Arrernte) people, who have been calling it home for more than 30,000 years. It was John McDouall Stuart who first led an expedition through this part of the continent, establishing a south-north route from Adelaide to Darwin.  The town got its English name from Lady Alice Todd, wife of Sir Charles Todd, a telegraph pioneer and Postmaster-General of South Australia from 1870–1901. In 1887, alluvial gold was discovered near the area, attracting people to settle in Alice Springs. During World War II, the town became an important staging base for the Australian military. In the 1960s, the government established here a joint defense monitoring base with the United States. Today, Alice Springs is more like a tourist hub, closest to many of the Outback’s most popular tourist destinations including Uluru. 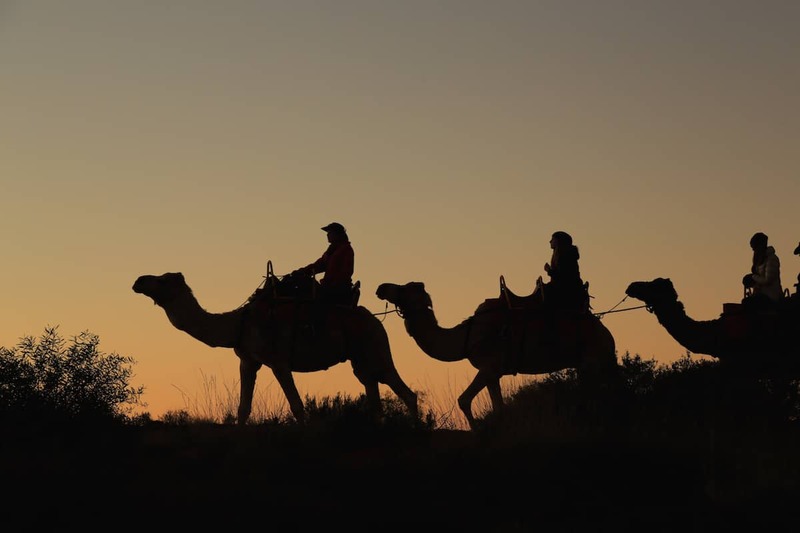 Photo by Uluru Camel Tour. Uluru, on the other hand, is a natural wonder. Its other name “Ayers Rock” was given to it in 1873 in honor of Sir Henry Ayers. Today, both names are accepted. Since it was opened as a tourist site in 1936, it has been promoted as a place to climb, which (among others) upsets the local Pitjantjatjara people. For them, Uluru is sacred and they have always been forbidden to climb it. On 26 October 1985, the land was returned to the local Aborigines by the government but must be leased to the National Parks and Wildlife Agency. The government and the locals then started co-managing it. 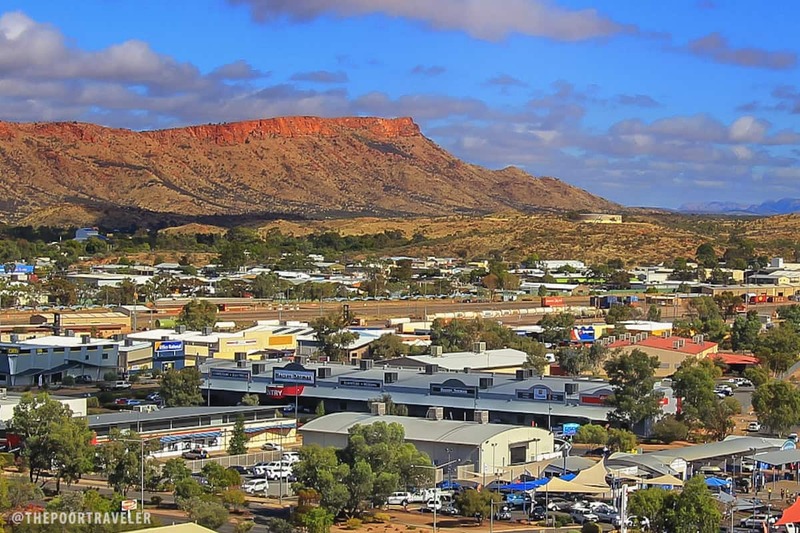 The town nearest Uluru is Yulara, but Alice Springs, located five to six hours away, is also a favorite among tourists because it is much larger and the road in between stems out to other key attractions in the Outback including Kata Tjuta and the Kings Canyon. The point is: even though Uluru and Alice Springs are six hours apart, if you visit one, it’s best to go see the other. Alice Springs and Uluru have their own airports. To get to the town proper from Alice Springs Airport, you may board a shuttle bus operated by Alice Wanderer Airport Transfers. There’s a bus for every flight coming in and going out. If you avail of this service, you can be picked up or dropped off at your hotel. 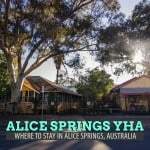 You can book online at www.alicewanderer.com.au or you can do that at the airport. Tickets cost AUD16 per passenger (per way). At Ayers Rock Airport, there is a free bus that takes passengers to resorts and hotels in Yulara until 12:30am. 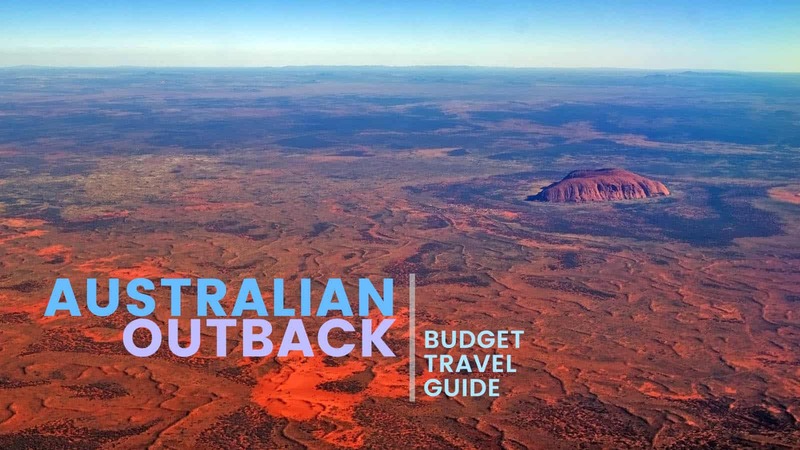 The three key destinations in this part of the Outback — Kings Canyon, Kata Tjuta, and Uluru — are closer to Ayers Rock Airport than Alice Springs, so if for whatever reason, you can only choose one, fly to Ayers Rock. But the best way to do it is to fly in via one and fly out via the other. This way you get to experience both areas. This is especially advantageous if you’re going on a multi-day camping tour. 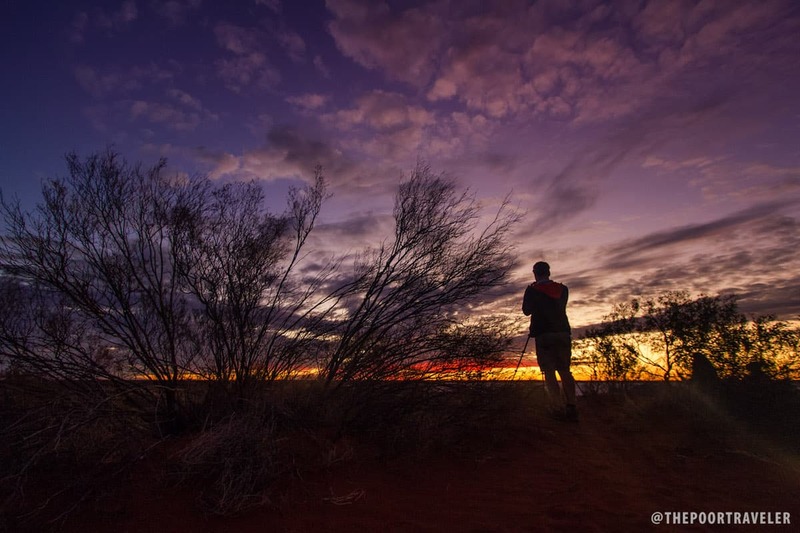 According to the locals we have talked to, the temperate days of autumn (March-May) and spring (August-September) are pleasant for exploring the Outback, but the month of May in particular is the best time to visit. The skies are also clear, which is great if you’re hoping to shoot postcard-worthy photos. However, these are also the high seasons, which means you will be sharing the sites with a lot of other tourists. We visited in the middle of winter. Daytime temperatures played just around 20C, something that I found very comfortable for hiking. But nighttime numbers dipped to below zero, usually leading to frosty early mornings. If you’re planning on visiting in June or July, make sure you’re well equipped for the cold. Jackets are a must! 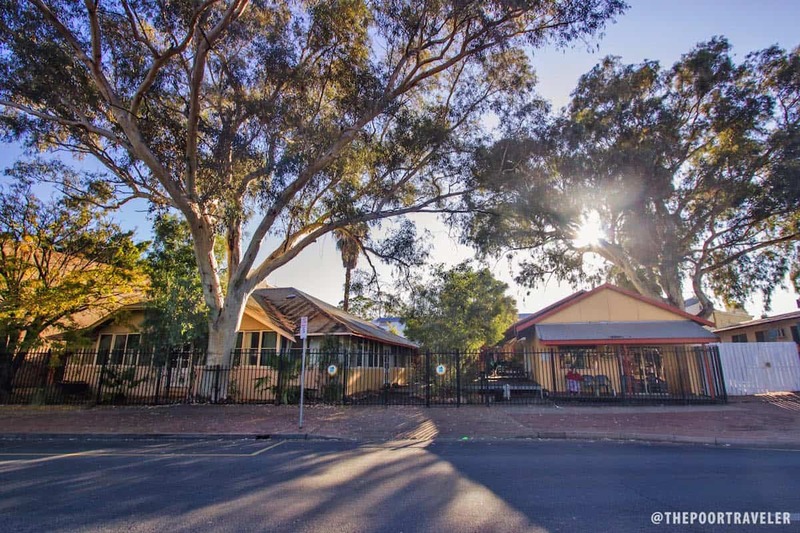 YHA Australia has hostels strategically located in Yulara (Ayers Rock YHA) and Alice Springs, perfect if you’re on a tight budget. The thumbnails below will take you to specific posts. 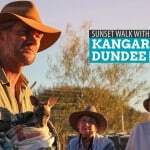 Sunset Walk with Kangaroo Dundee. AUD 85. Kings Canyon. Part of Rock Tour. AUD 375. Kata Tjuta. Part of Rock Tour. AUD 375. Uluru. Part of Rock Tour. AUD 375. 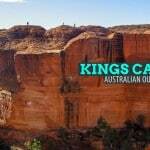 I have to say that the best part of the tour is the Kings Canyon. (It was also the hardest part.) That’s my personal opinion. 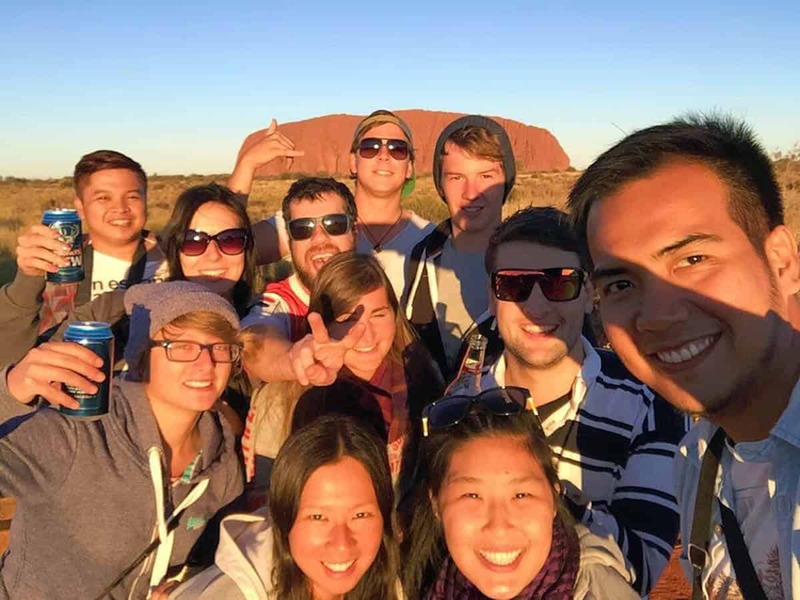 People are usually shocked when I say this because they expect Uluru to be the highlight — don’t get me wrong, it was magical watching the sunset and the sunrise at Uluru — but those who were on the tour with us enjoyed Kings Canyon the most too. Alice Springs. There are taxis but they can be quite expensive. Besides, every point of interest in the downtown area is within walking distance. Yulara. There is a free shuttle bus that operates around the area every 20 minutes from 10:30am to 12:30am. 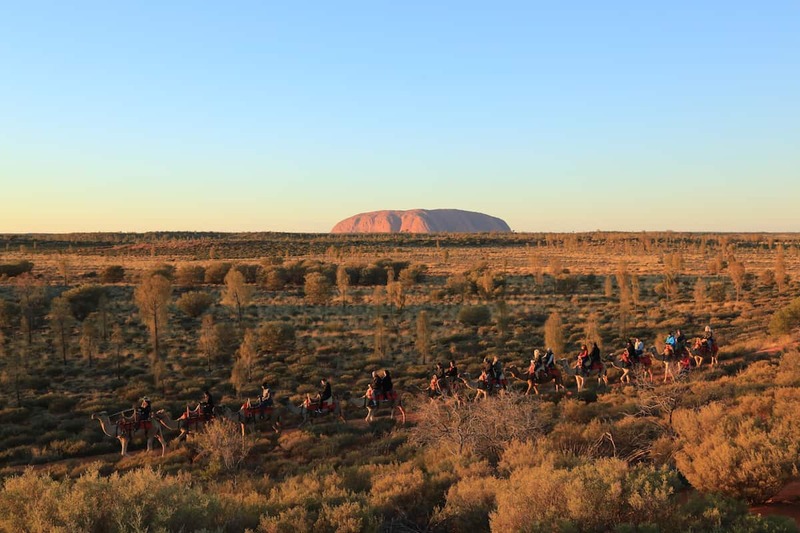 It makes a stop at the hotels, visitor center, Resort Town Square, Uluru Camel Farm, and the Campgrounds. If you’re a party of 3 or 4 pax, this might be a good option. But make sure you read all the terms and conditions before signing any contract. Also note the number of kilometers allowed per day, if you’re not taking an “unlimited” arrangement. Renting a car will allow you to take full control of your time. Below is a table of rates of Central Car Rental, one of the more well-known companies in Alice Springs. I haven’t tried them and this is not a recommendation. (I don’t drive abroad.) I’m just showing you their rates to give you a ballpark figure of how much you will be spending. 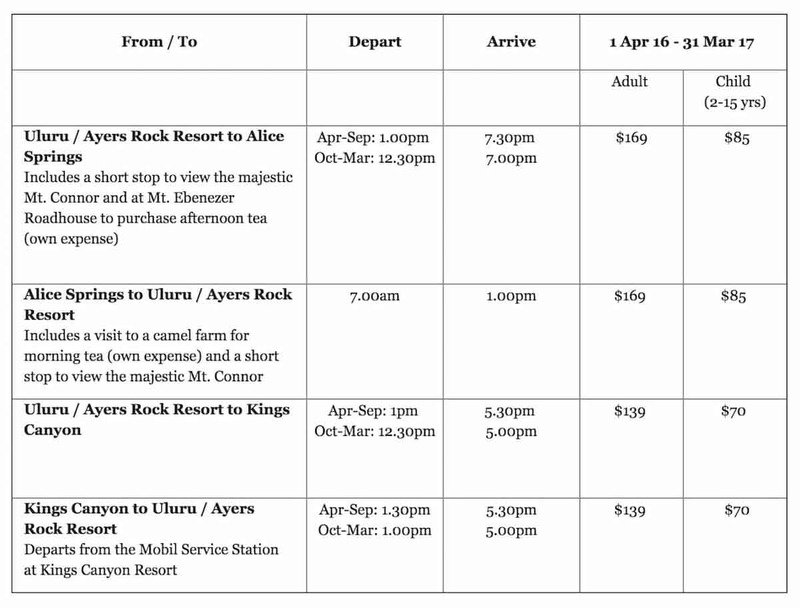 There are trips to Uluru and Kings Canyon from Alice Springs and Yulara. Below are sample fares. 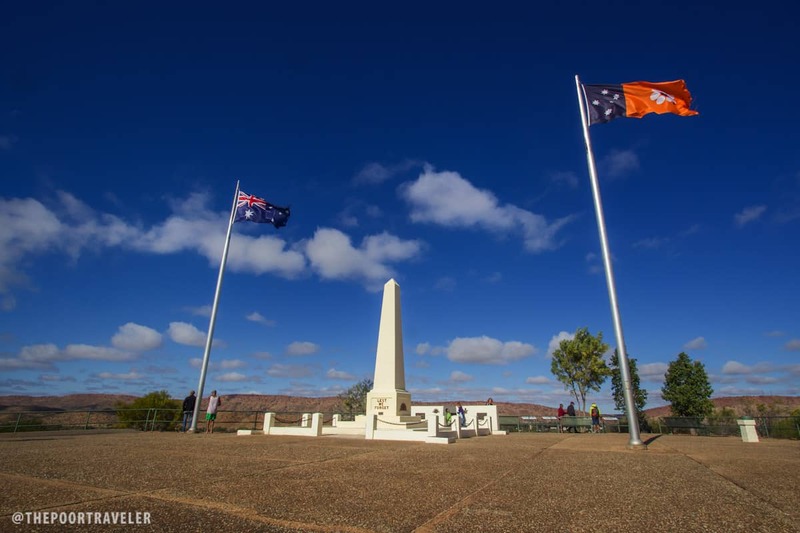 You’ll find group tours that you can join in Alice Springs and Yulara. These tours will take you around and then back to your hotel at the end of the day.  But the one we’ve tried and we can absolutely, whole-heartedly recommend is offered by The Rock Tour. 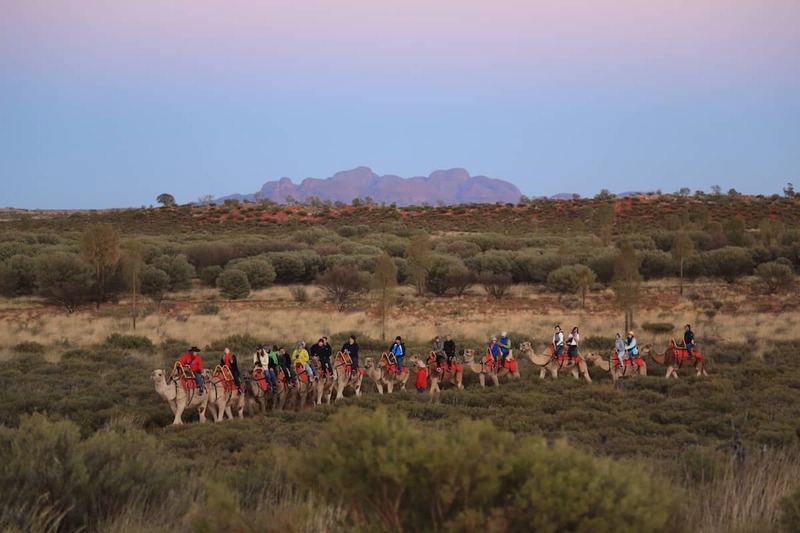 They can take you on a 3-day/2-night camping trip from Alice Springs to Uluru (or vice versa) and make stops at key destinations along the way. 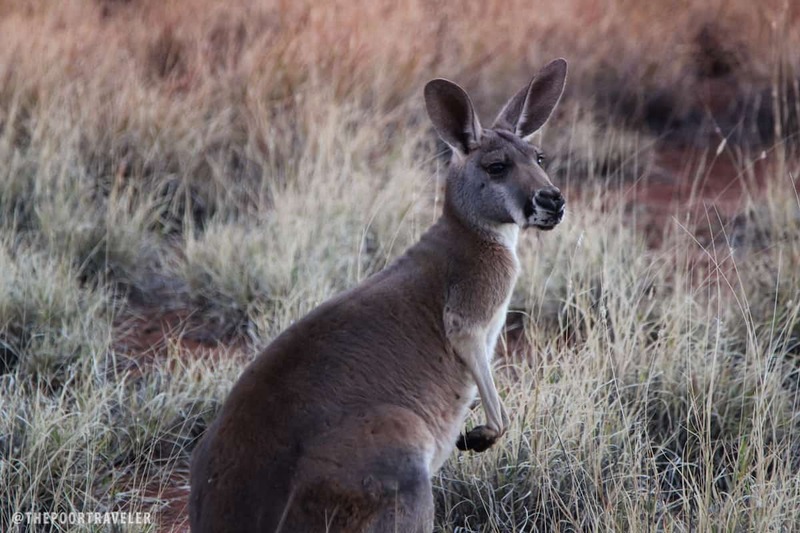 You may also choose to do a roundtrip Alice Springs tour. 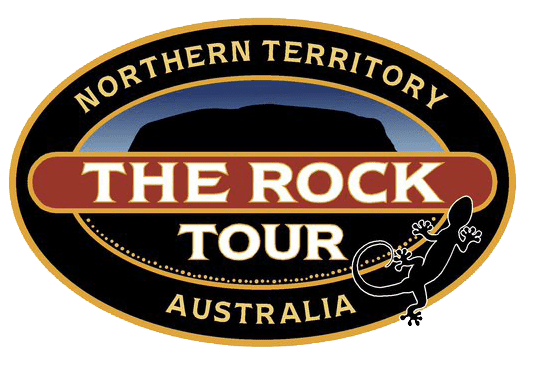 Each Rock Tour booking covers transportation, all meals for 3 days and 2 nights, swags, camping equipment, and a knowledgeable and experienced tour guide. Total price: AUD 375. Think about it: AUD 375 for everything you’re gonna need for 3 days. That’s a lot cheaper than doing individual tours for each site. Note, however, that camping isn’t for everyone. If you’re the type of traveler who’s obsessed with comfortable hotel-grade linens and who needs to use the toilet every 30 minutes, you might find it too rough or rugged. That’s us with our new friends! 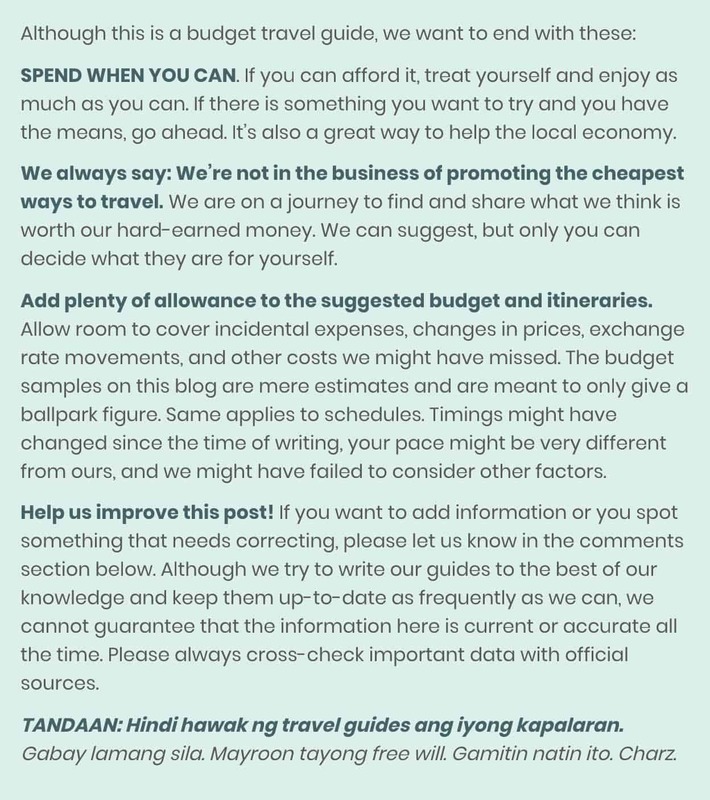 To give you an idea on how much the above itinerary will cost you, here’s a breakdown of possible expenses. 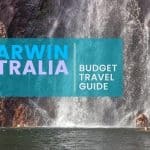 If you keep your food expenses on your first and last days below AUD20 per meal and you stay at dorms on your first and last nights, expect to shell out AUD 620 (USD 453.5) for the whole trip. 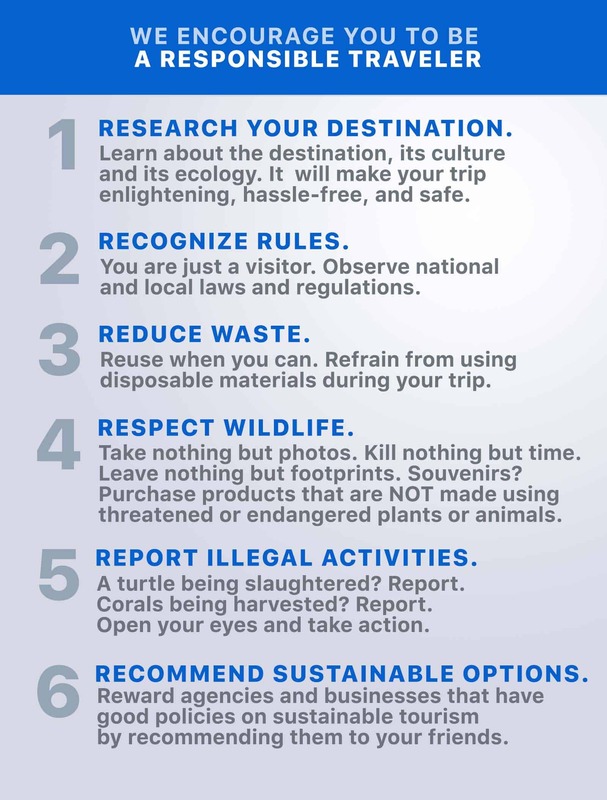 Note that this does not include airfare and incidentals (water, groceries) and souvenirs. You can keep the cost significantly lower if you cook your own meals. Choose a hostel with an open kitchen. There are restaurants and eateries in Alice Springs and Yulara, although very limited. But know that meals are generally pricey in Australia. The cost (usually around AUD15-25) can be quite shocking if you’re coming from cheaper countries like those in Southeast Asia or South America. But if you’re staying at a hostel with a kitchen open to guests, you can simply buy ingredients from the supermarket and cook for yourself. It’s your cheapest bet. Hit the supermarket before the tour. There are very few restaurant options along tour routes. Best to buy food before the trip so you won’t get hungry along the way. Bring a refillable bottle. 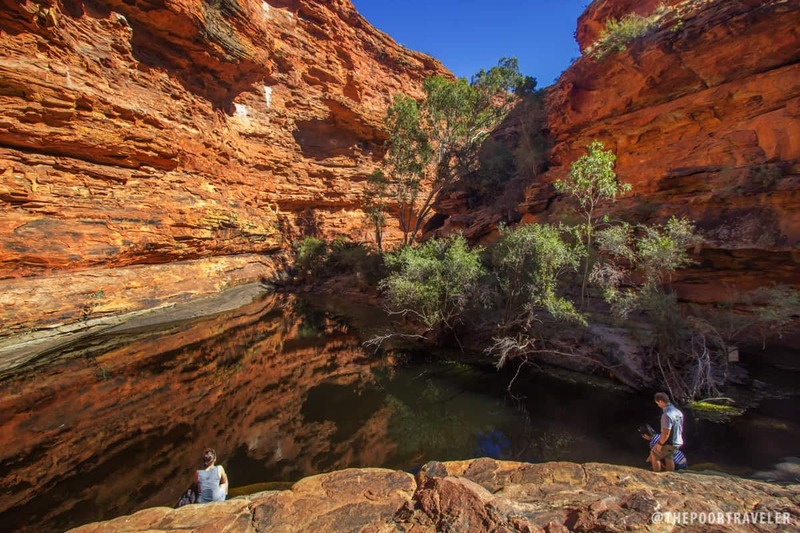 There are plenty of water refilling areas around Kings Canyon and Kata Tjuta. Fill up when you see one because stops are so far apart (often hours). Wear comfortable hiking shoes. If you plan on exploring the sites, know that there might be a lot of trekking and a bit of climbing. A good pair will make your trip more enjoyable. Check the weather before packing. I know this sounds obvious, but we’re just reiterating. Most people prepare for the daytime heat just because it’s in the middle of the desert, but ready a thick jacket for the cold nights too especially if you’re visiting in winter. We didn’t realize it would be super cold (approaching zero) so we had to buy pants and more layers in Alice Springs. You can exchange currencies in Alice Springs. 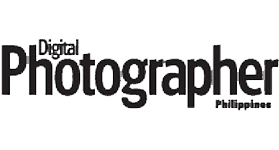 We’ve tried transacting at a major bank in Alice Springs and the rates are good and the experience pleasant. We’re not sure about Yulara.